From beginner to expert surfer who is looking for a new challenge: we offer 8 different classes which are perfectly suited on your level, your sportive ambitions and your available time. In the morning, whit north wind "Peler": A1 Beginners, A2 Advanced course, Allround Fun A3. 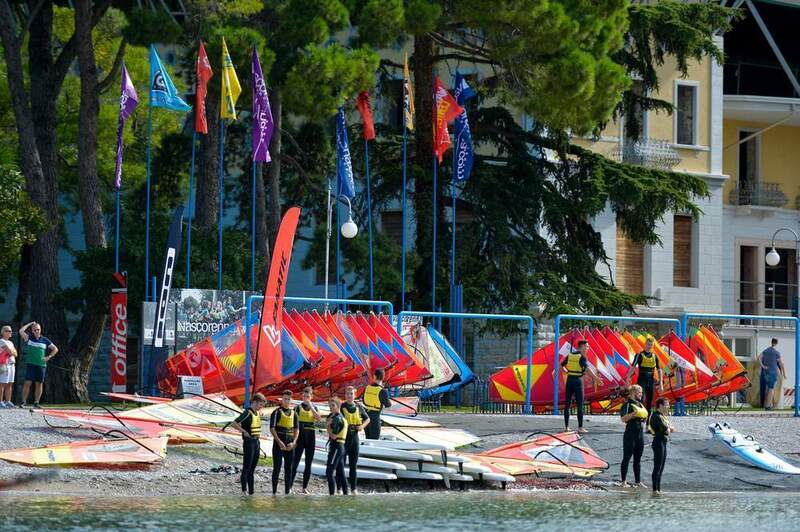 In the afternoon with the mythical "Ora" ( wind from Sud): A4 Water Start, Fun A5, A6 Fun Pro, A7 Special Fun, A8 Freestyle for everyone. In our surf centre we established our own programme for youngsters. There are instructors who are specialized in teaching kids and understand how to address them in a way which enables them to achieve best results in a playful manner. 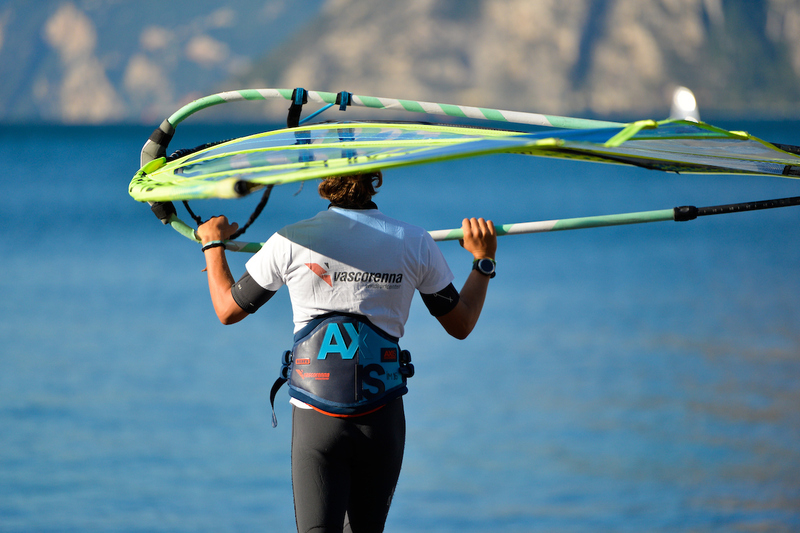 We will provide a specific equipment for the kid’s courses, which is smaller, lighter and is tailored to the body build of the smaller windsurf students. What is SUP? The abbreviation stands for Stand Up Paddle, you can practice SUP as well as on waves as well as on flat water as an activity to prepare yourself for Windsurf or as an aerobic activity like Nordic Walking. Other people practice this sport to relax or to relieve daily stress and who uses SUP to do beautiful excursions in the nature. 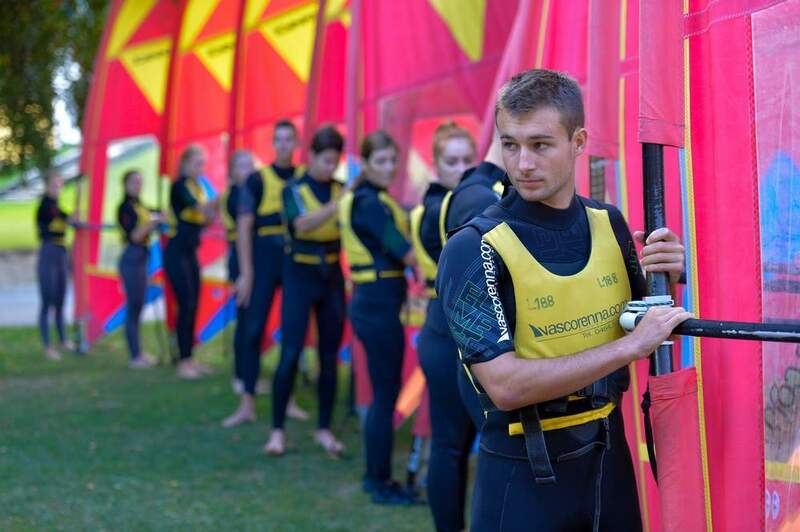 The subscription to one of our courses provides the use of all necessary equipment - board & sail, 'ION' wet suits in three different styles, fitting for different seasons, life jackets, harness (when necessary), Instructor, assistance from our staff on shore, changing room, shower, wc and safety box deposit. 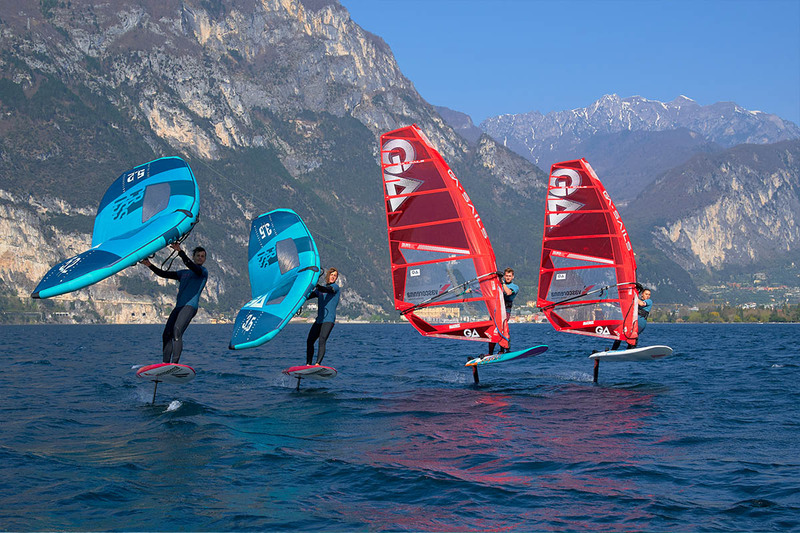 A new, incredible and unmissable experience with the windfoil: you’re going to learn to fly on the water with our instructors. Book your private lesson. 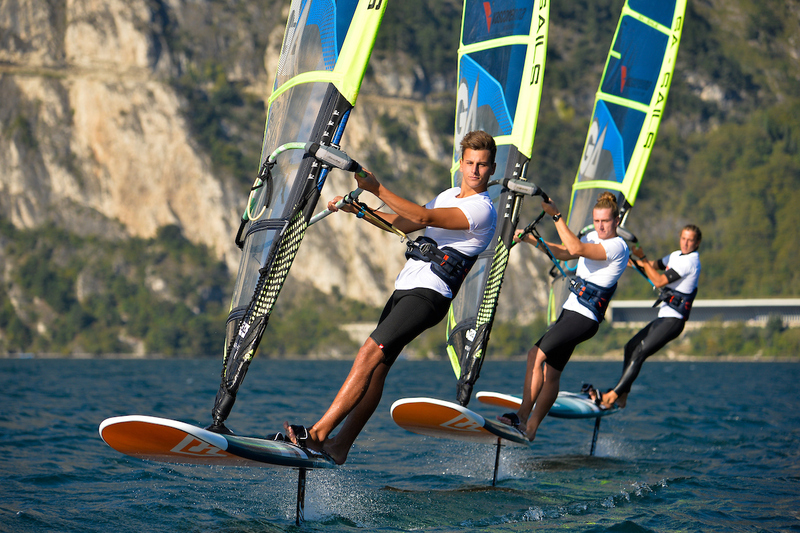 To participate at the lessons is necessary to know how to glide (A5 level). 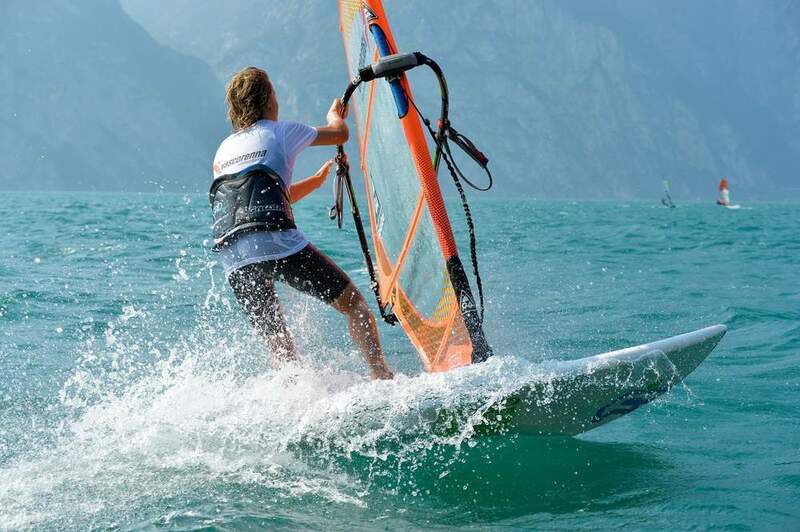 Theoretical and practical course to approach windsurfing and learn a few basics. In this beginners course you’ll learn: Sailing in various course directions with optimum body and rig-position, tack and jibe. 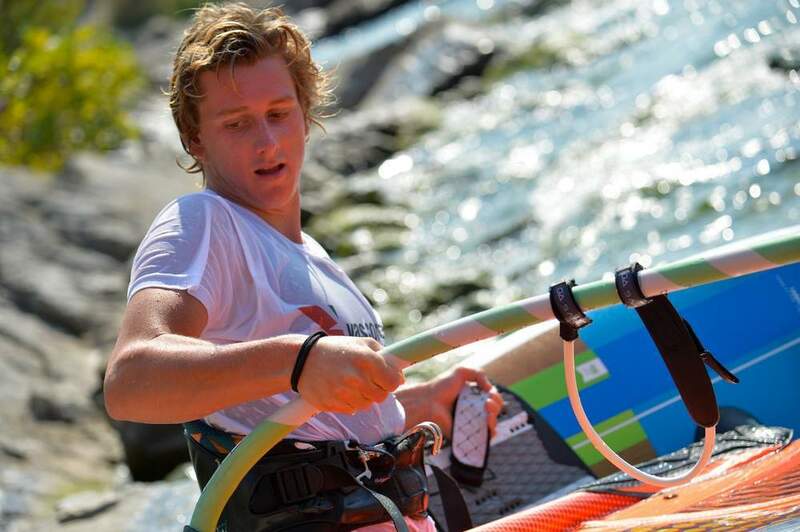 The newcomer to windsurf can sail on his own after completing the course. Theoretical lessons, navigational regulations and safety rules plus the assembly of board and rig will be discussed. The course will be held in the morning, in light or middle wind conditions. 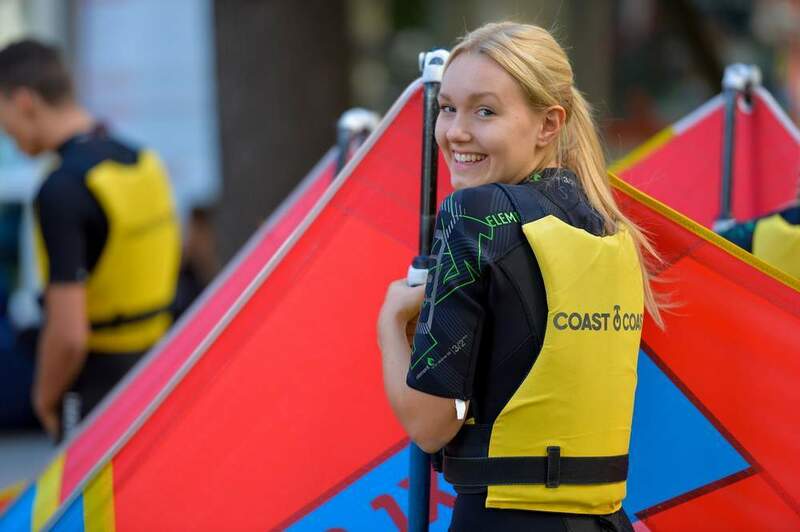 The course is intended for everybody who has passed the first couple of trials with the board and rig and would like to improve the manoeuvres. Focus is on the fast tack and jibe. Furthermore an introduction in the techniques of harness sailing and first attempts of the beachstart will also be taught. Course time: In the morning, during middle wind conditions. 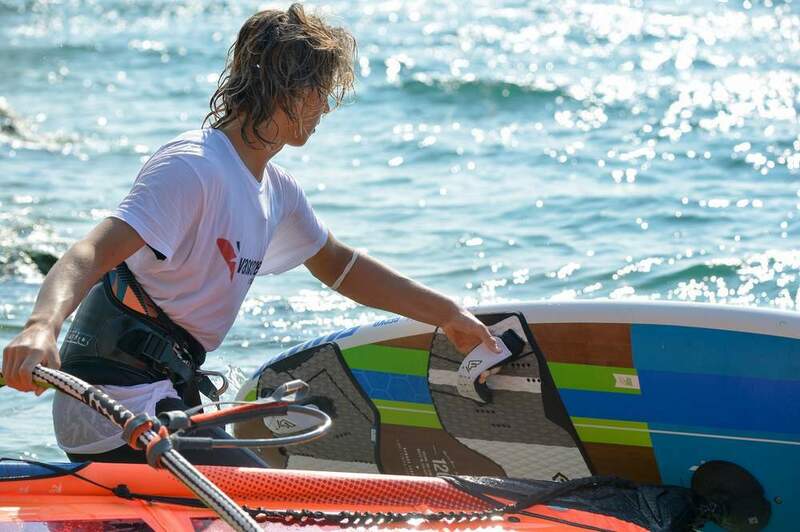 The aim of the course is safe sailing in middle wind conditions with progression to the funboard. This course covers the techniques required for successful planing in higher wind. For this course we use the morning wind from the North or the South wind of the afternoon. 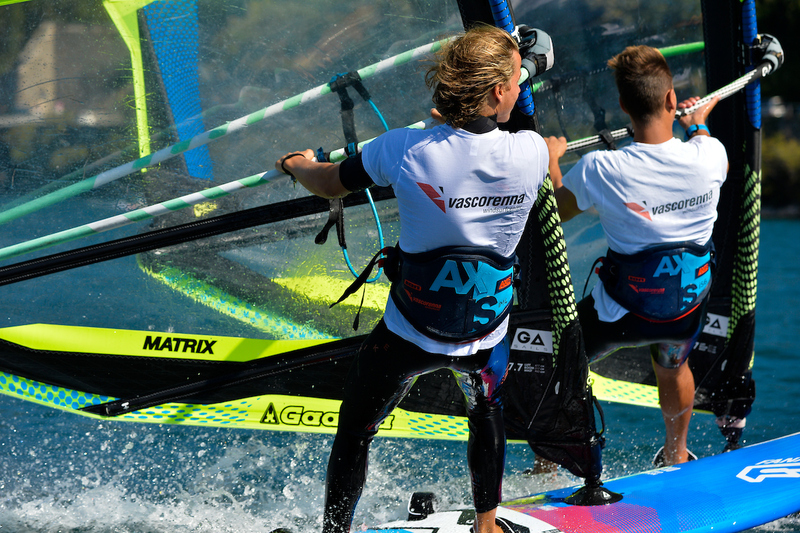 Included in the course is how to footsteer the board and use the footstraps also how to sail the board without the daggerboard as well as the fast tack and the beachstart is stronger wind conditions, thus preparing you for the waterstart. From this point on, there are no limits to have fun on the water! This course is the first of our afternoon sessions held during the stronger "ORA" wind. The type of boards used for this course are allround fundboards, featuring footstrap. 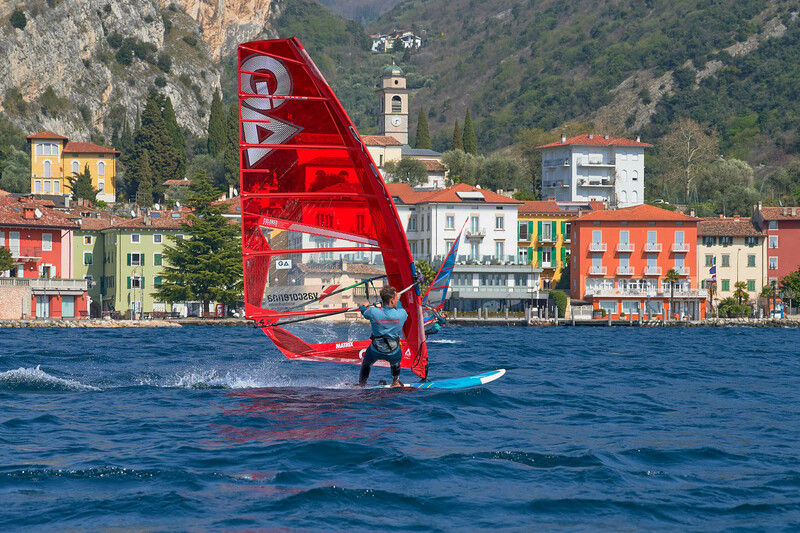 This course focuses the waterstart, one of the most essential techniques required for succesfull highwind surfing, and also he beating techniques to go upwind with or without the daggerboard. When you have achieved a good level of competence with the waterstart practice will then be done in deaper water. Having mastered the Waterstart, you can now start using smaller boards without daggerboards. The focus of this course is planing and the use of the footstraps. The training aids used for this course are the planing simulator, which allows us to try on land all the different movements required to enable the board to plane, including the theory of wheight distribution abd how and when to use the footstraps, and for when we are on the water, we use the Video Playback System in wich you are filmed on the water and then played back later where the feedback is given by the instrucotr in order for you to understand and thus improve. 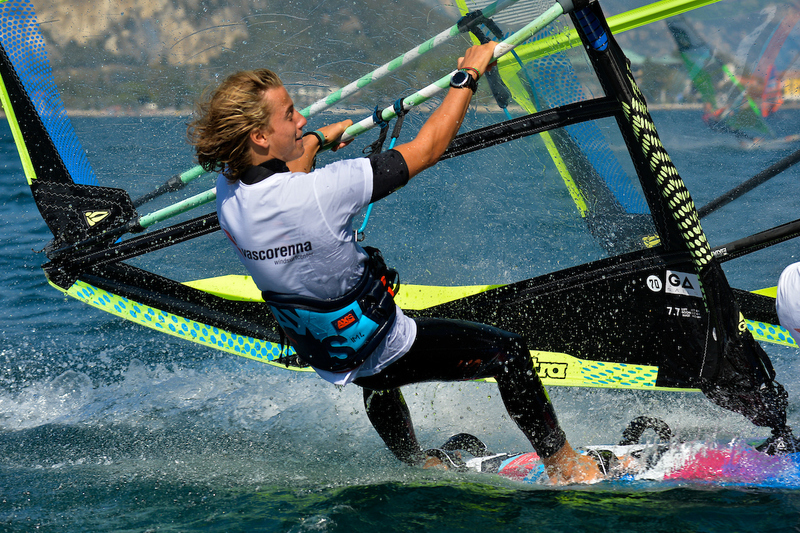 Having perfected the plaining techniques from the previous level, the Powerjibe is the next major objective, it is one of the most desirable manoeuvres for all surfers, for a more comprehensive learning of this technique we have broken it down in different stages: fast start, change position, perfect body and sail position, foot change position and shifting the sail. All the above theory together with the help of the Video Playback System which will give us the change to review everything slowly, frame by frame, making corrections. Now we are at an advanced stage where even experienced surfer can add new and exciting thecniques to their repertoire, making use of our High Jump Simulator and training DVD you can choose to learn one or more of the following manoeuvres:"Race Jibe", "Duck Jibe", "Aerial Jibe", "Carve 360", "High Jump Technique" , "Helituck". The A7 group classes take place with a minimum of 3 partecipants. In case this number cannot be reached the same program can be dove by taking private lessons. The A8 group classes take place with a minimum of 3 partecipants. In case this number cannot be reached the same program can be dove by taking private lessons. 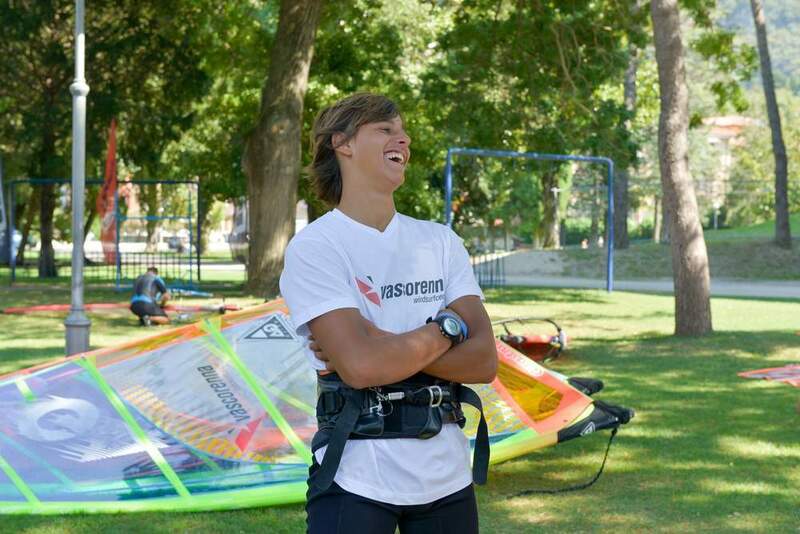 Young children between 8-14 years old can now learn windsurfing in a funny and playfully way. 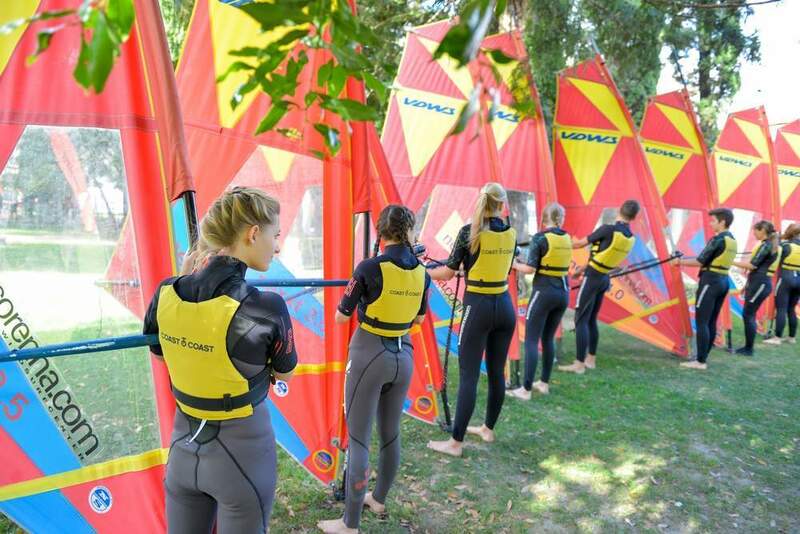 The course programme considers both, theory and practice: Surfing in different directions , tack , simple jibe , and an introduction to the safety rules. Special focus is on the proper technique and bodyposition. We provide special light rigs designed for kids. 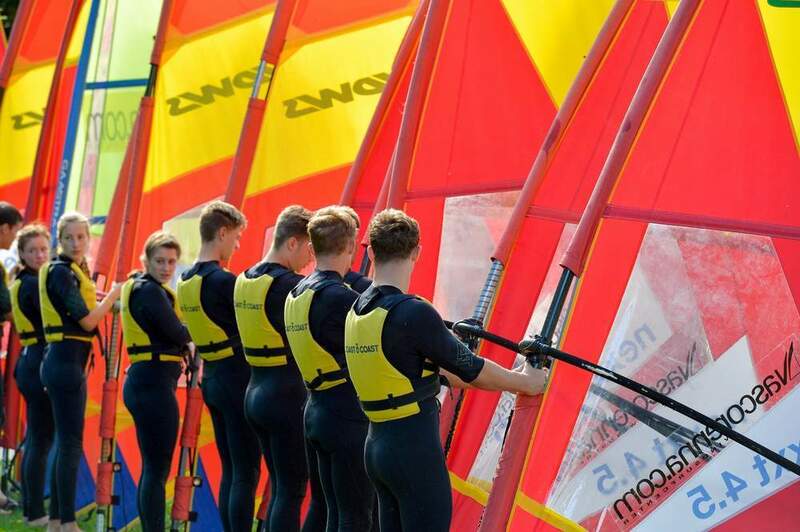 At the end of the lessons the young windsurfers are able to windsurf safely on their own in lightwind conditions. In the courses from B2 to B7 the kids reach, step by step, the same course goals as the adults (described in A1 to A7) , just with different teaching methods and special equipment. From the 1st to the 5th and from the 8th to the 12th of July it’s going to be held, from 9:00 o’clock to 16:00, two Surf Camps. Ideated for children aged between 7 and 13 years old, thought for everybody, from beginners to the experts. 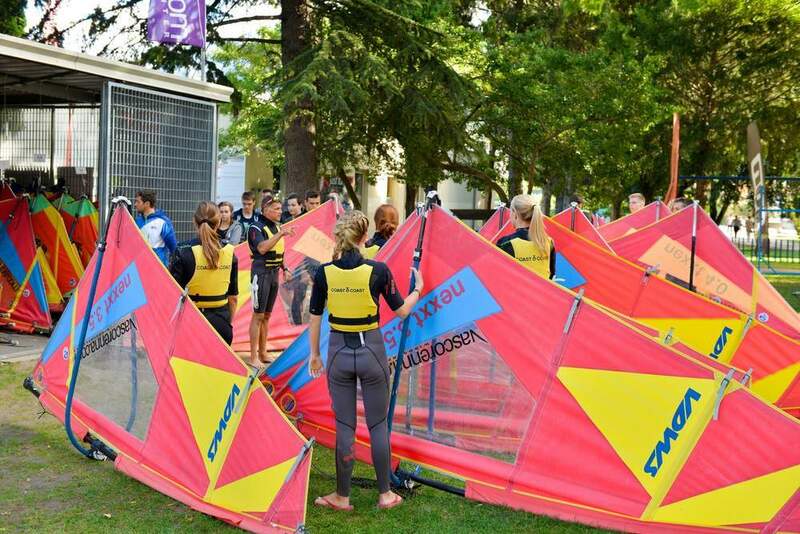 The goals for the beginners are to get closer to windsurf by reaching a first autonomy level on the board, to learn to know the wind and to live the beauty of sailing sports, and for the experts the goal is to reach the best surf level possible. 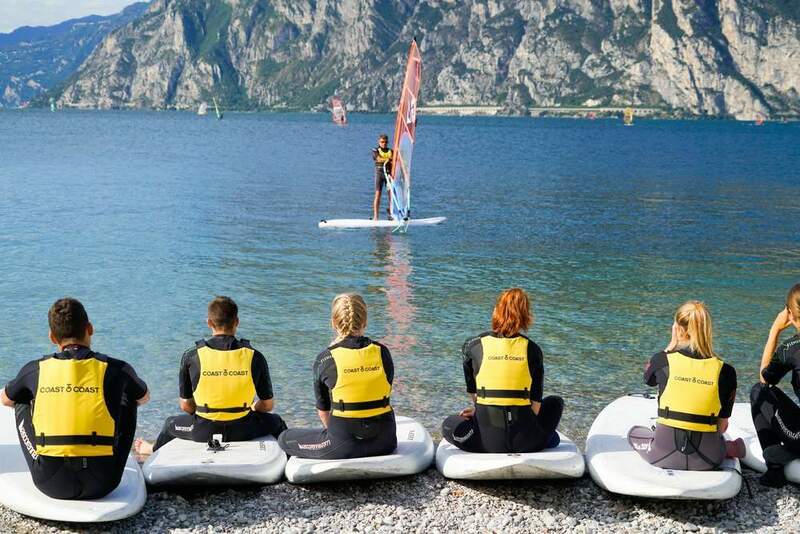 In our center you can find VDWS instructors who will bring you nearer to this sport teaching you all the tricks for an efficient and relaxing paddling and guide you to discover the Lake of garda following new paths. 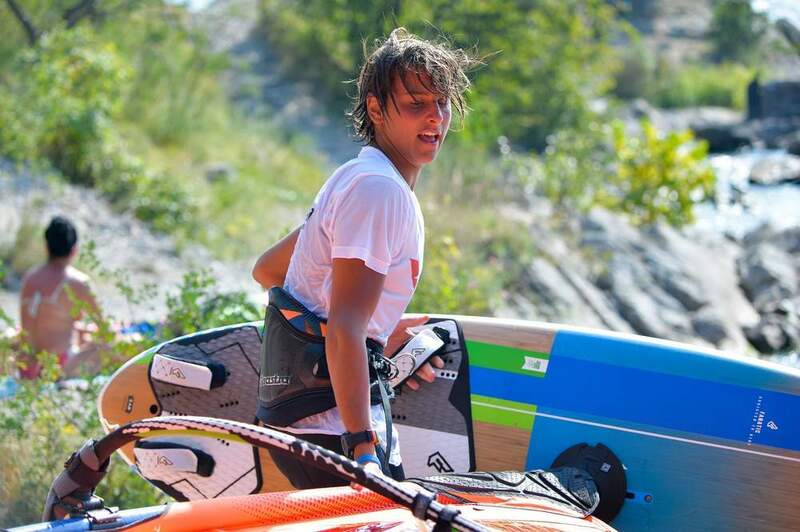 During this course you are going to learn the basic knowledge concerning the equipment and the security and the balance on the board and the use of the paddle. After a theoretical part at land you start with balance exercises in the water in order to get used to maintain the balance point on the board. The lesson continues combining the balance on the board with the paddling. Gaining self-confidence on the board you start to improve the paddling in order to increase the efficiency and to decrease the wast of energy, increasing proportionally fun and resistance. Even the ease of handling of the board improves, allowing you to do reduced the radius of curvature. The duration of these excursions depends on the aerobic conditions and the technical level of the students and also on the weather conditions. Normally you start with the north wind and you come back with the “ORA” blowing from the south. In this way you make the most of the boost wind power getting the possibility when you return to surf some waves. At half way you relax having a break in one of the small beaches that the Garda Lake offers to eat something. During the excursion the trainer has the possibility to give you some advices concerning position, paddling and other little secrets of SUP. You are a family of four and you would like to take part in one of our courses then take advantage straight away of our 10% discount. If you are able to form a group of friends that would like to take part in one of our courses then our prices can become especially conveniente for you. The discount cannot be cmbined with other promotion. On request you can receive private lessons with or without personal equipment. Additional lesson € 57,00. Morning courses last 3 hours and a half a day. Afternoon courses last 4 hours a day. With 2 participants only courses last 2 hours and a half a day. Will be held every day of the week and in every kind of weather. 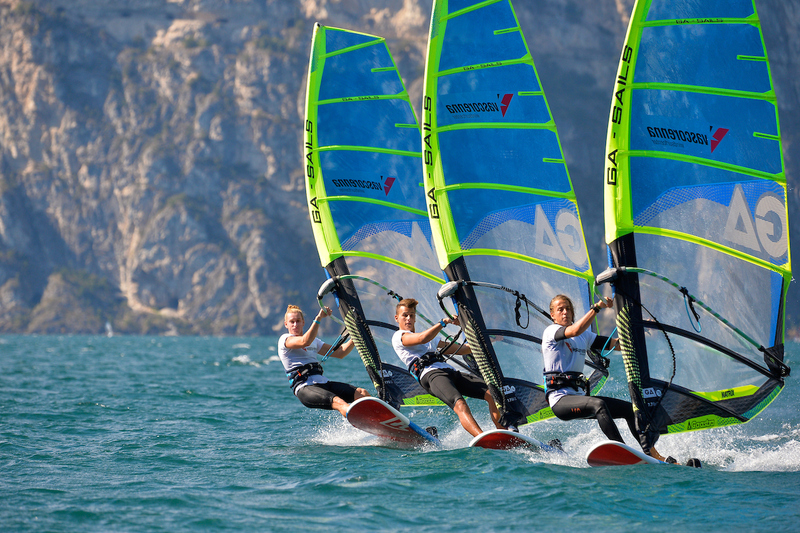 The course program includes theoretical lessons on land and afterwards the practise in the water. Before the beginning of the course we teach the surf levels of the participants so that they are placed in the right course. If it turns out during the course, that the skill is not going along with the level of the course or you improve, a change will be made to the next level in order to guarantee faster learning success. All courses can be held in German, Italian, English, French and Dutch/Flemish language. 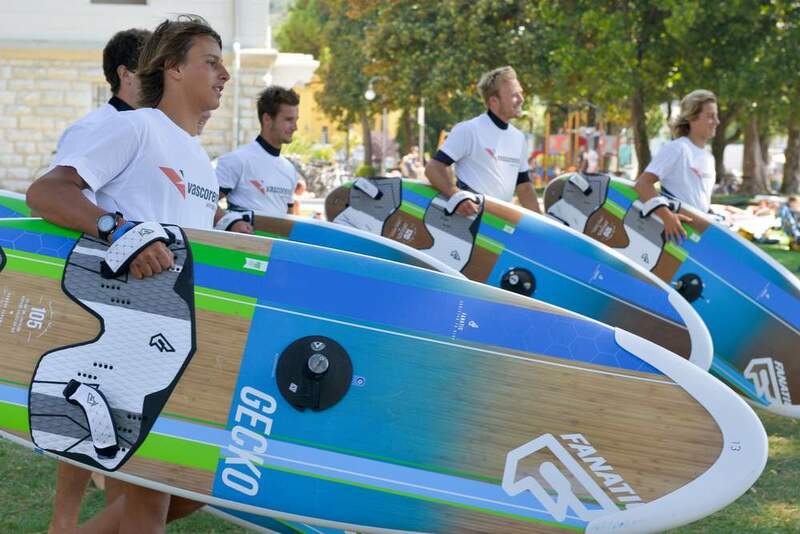 At the end of the course the school gives to every participants the Ability Surf-card. It is a personal membership card that indicates the level reached by the student upon completion of the course. On request and after an examination the international VDWS licence. At the request of the participant, the courses can be divided up into weekends. 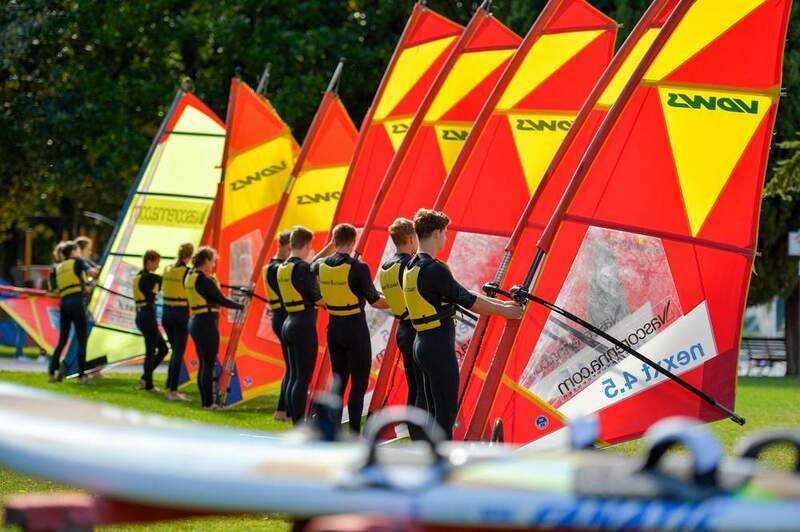 Anybody, who would like to participate in a windsurf course at our centre, must bring a valid Identity Card , which will be kept with the secretary in the office for the time of the course. 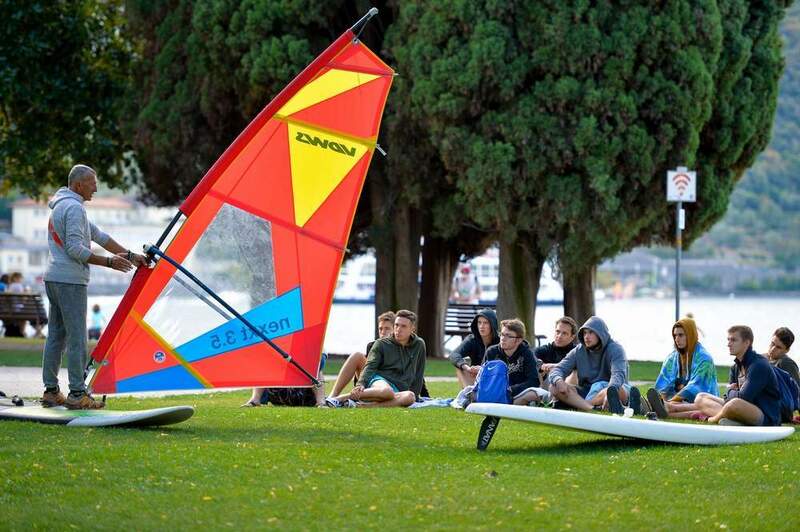 The school (except the A1 and B1 course) can't take responsibility for damage of the windsurf equipment. Every student is responsible for the equipment used by himself and they can sign for an insurance to cover against. A specially developed planing simulator together with the instructions of the teacher will help you. You can train and study the different movements to do. The Ability Surf Card will be given to all of our participants taking part in our courses. It is a personal membership card, which indicates the level reached upon completion of our course. Acknowledge as the best teaching method to learn the most difficult manoeuvres in a short time. During the lessons in the water the instructor films the manoeuvres performed by the student in order to watch them after the class and correct them. The Video Clinic Control method is used for the advanced courses. Special light weight equipment has been designed for the female surfers. The booms, designed with a reduced diameter and carbon made masts, guarantees their lightness and makes them easy to handle. These are the characteristics that allow the surfer to face less physical strain therefore ensuring a quicker learning process, whilst at the same time, providing a more enjoyable, satisfying and rewarding experience. A worldwide valid license which allows you to rent windsurfing equipment in any school in the world, comparable to the PADI for scuba divers. 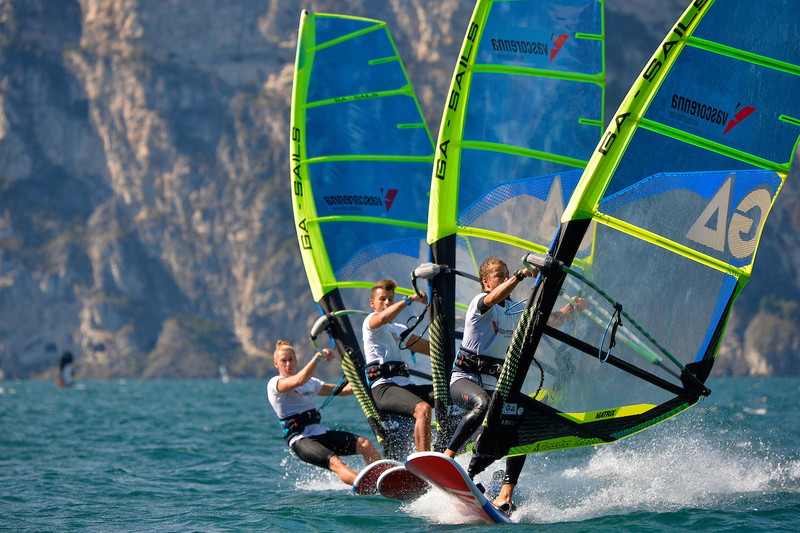 To get this special license you must pass a test in addition to the standard windsurfing course at our school. The cost of the license amounts to € 30,00. 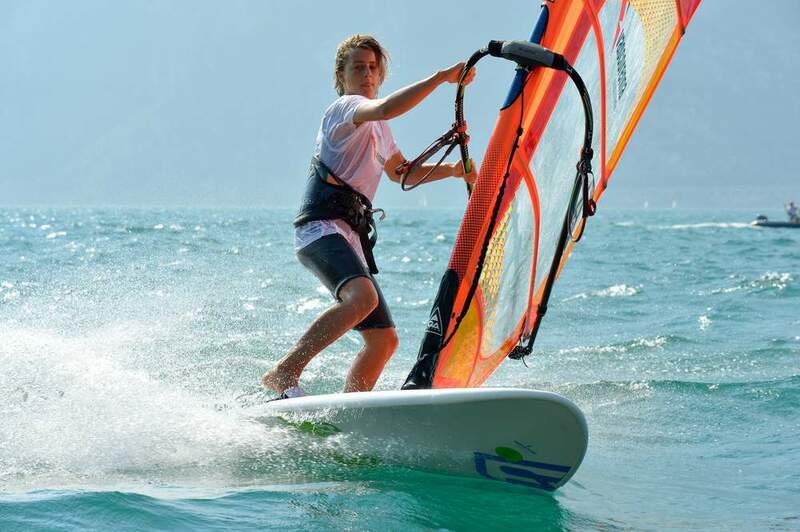 Gliding, Jibing or even extreme Freestyle manoeuvre are not a problem anymore even for young windsurf talents. 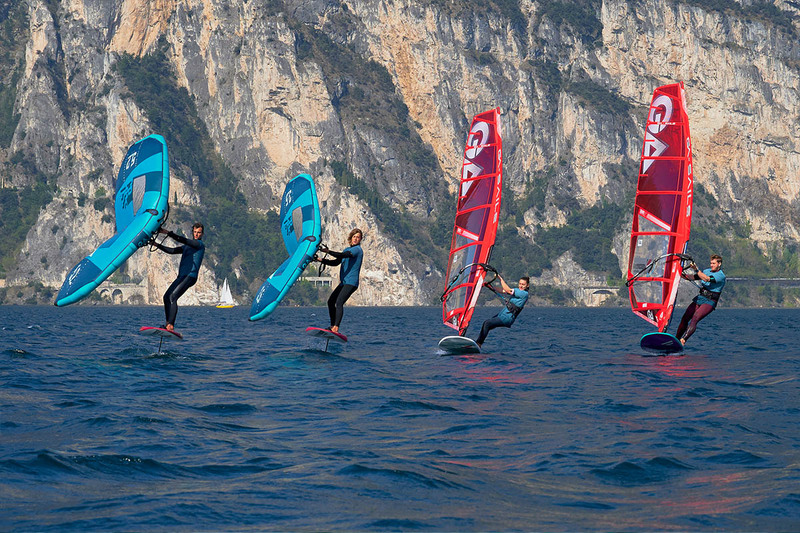 At Vasco Renna Surf Center you'll find special rigs with shorter masts, booms and minimum weight for an easy and quick learning for future windsurfers. 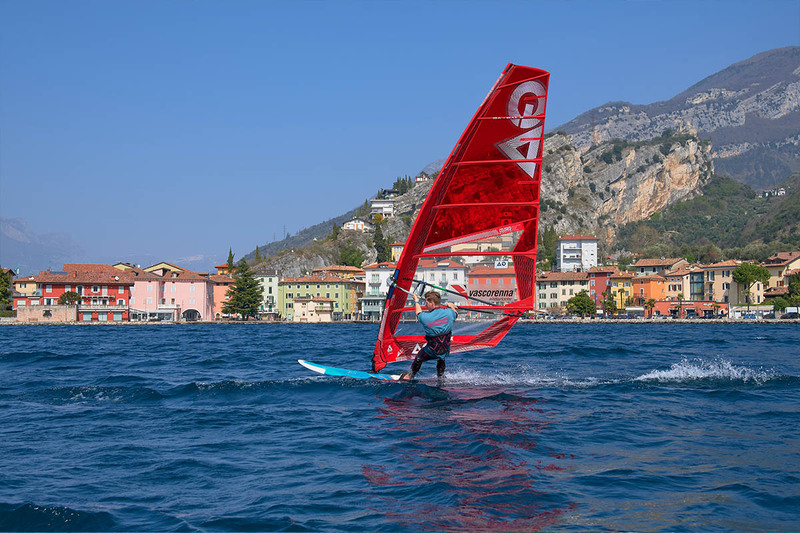 Vasco, national olympic multi-champion and I° degree federal instructor, guarantees the highest levels of professionalism of the school, recognized by the Italian Sailing Federation. If you're a good surfer and you think to have what it takes to teach at our Center you can take the courses, take the tests and do an internship to get the VDWS international instructor license. In the event a course cannot be completed for lack of wind, the school will grant the attending student a voucher to re-attend the lesson in the future ( last minute lessons are not included ). The school insures every course participant with a RC insurance ( Reale Mutua Assicurazioni ) which is automatically drawn up after signing up and paying for the course. 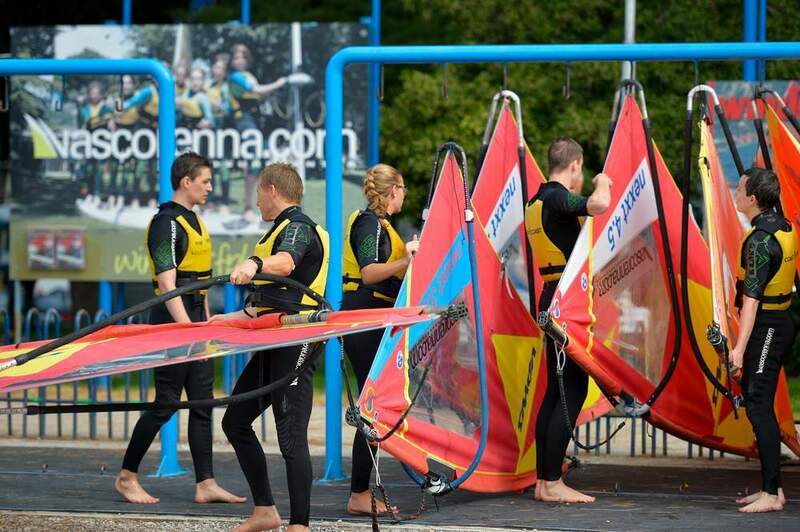 Are you un-sure when you'll have a free Saturday or Sunday to come and learn windsurfing with us? It's not a problem as you can purchase extra days on one of our courses and use them at the weekend of your choice anytime during the season. We offer group courses at convenient prices, including an accommodation in Torbole if needed. 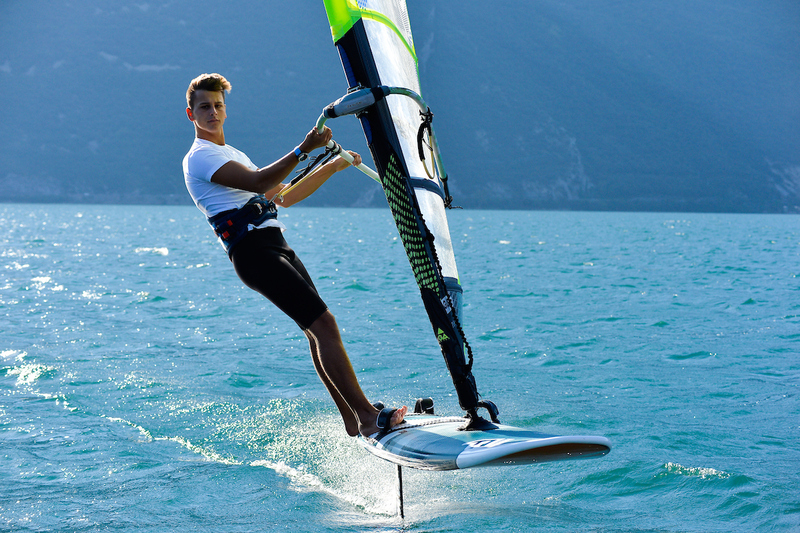 With us you can make a holiday Windsurfing present to friends and family. Contact us for more info.